Here you can change the settings of ASAP Utilities. When you press the "OK" button the changes will be saved, except for the language. If you change the language this is immediately saved. You can switch on/off the question that sometimes is asked before running the utility. For example a question such as "Do you want to convert all text in the selected cells to UPPERCASE?". By default this option is checked. Turn the undo on or off. Sometimes to increase the speed you might want to turn off the undo. Use the F11 key to switch between full screen and normal view. Excel does not have a shortcut to switch between full screen and normal view. In most internet browsers you can use the F11 key to do this. You can now choose to use the F11 key to switch between full screen mode in Excel with ASAP Utilities. By default Excel uses the F11 key inserts a chart sheet in Excel but you can also do that with the key combination Alt+F1. You can choose if you want the menu to be numbered. This option is only available in Excel 2000/2002/XP and 2003. You can choose if you want the menu items in the submenus to be numbered. This can make it easier to quickly find a tool in the menu. 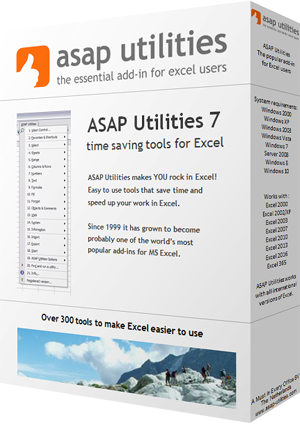 Show the ASAP Utilities menu also in the Add-ins tab ('classic' menu). This option is only available in the ribbon of Excel 2007 or later. Allow ASAP Utilities to report anonymous usage statistics. These usage statistics do not include personal information, such as the data you work with. Usage statistics do include the following information from your computer: Windows version and language, Excel version and language, ASAP Utilities version and language, and the id's of the 10 tools used most often and your ip address. Here you can change the language of ASAP Utilities into one of the available languages. This tab shows you in which folder ASAP Utilities is installed. Folder to store your "Favorites and shortcuts" file. Here you can specify the folder where your favorites menu file is stored. If you work on multiple computers it can be useful to store the favorites menu file on a network folder so that it is accessible from both computers. If you pick a folder that doesn't have a favorites menu file yet, a file with the default settings will be created. Default path to save a backup. Here you can specify where the backups are saved that are created with the "Save file and create backup" utility. Here you can turn the file size toolbar on or off from here. You can also change the refresh time to update the file size toolbar. This option is only available in Excel 2000/2002/XP or 2003. If you encounter problems and you contact us, then please provide the information displayed here. It will give us information about the version of Excel and ASAP Utilities that you use, including some other important information. When you click on the button "Copy info to clipboard for use in email" the information will be put on your clipboard and you can easily paste it into an email to use where you describe the problem. More information about contacting us is written in Chapter 8, Troubleshooting FAQ of the User Guide (English). Important: We can only help you if you communicate in English or Dutch. In some cases you will be advised by the ASAP Utilities support team to turn on this debug setting to help solve specific problems. This log file records certain steps in ASAP Utilities and can help detect at which point something goes wrong.